The madmen! A moment of prosperity blinds them. But it is beyond their power to oppress and humiliate the French people. If they set foot in France, they will find their tomb. Let those among you who were prisoners of the English tell you of their experiences on English ships and of their horrible suffering! Soldiers, we shall have to make forced marches, fight battles and face many perils; but, we shall reconquer the rights, honour, and happiness of the Fatherland. For all Frenchmen of courage, the moment has come to conquer or die. As courtiers proclaimed these words to the passing troops, the French Armee du Nord crossed the frontier into Belgium. Since his flight from Elba, Napoleon had once again taken the Imperial throne of France; once again chased the Bourbons from their hereditary soil; once again presented a constitution to the deputees of the National Assembly; once again restored the Army to its place of honour among the French populace. He was back, as he had promised, before the violets bloomed. But, once again, he was declared an enemy of every sovereign state in Europe; outlawed by their monarchs...to be apprehended or shot on sight by any person who valued peace and servitude above equality, honour, or liberte. To those who would destroy him, he extended an olive branch. He humbled himself, only asking that his father-in-law, Emperor of Austria, restore to him his wife and child...how tall is my son? For nearly a year his letters had gone unanswered...What is the colour of his hair? Intercepted by spies his entreaties entertained the dilettantes of the Viennese court...Does he ask for his father, or has his very nature been turned against me also? Fresh from their year-long debauchery the congressional princes of Russia, Prussia, Austria, England, and Spain could only respond with declarations of war. He had but two short months to prepare France. The Bourbons had allowed the Armee to languish in neglect...the best of the soldiers pensioned off, or dismissed outright; the arsenals were empty; the treasury bankrupt...but was it not the people who had carried him up the steps of the Tuileries? Their energy, combined with his singular genius, he recognised as his sole assets for the coming campaign. As the tricolor cockade enthusiastically spread throughout Paris...as the violets bloomed in the French countryside; France organised for war...La Patrie en danger! The Prussians and English were the first to move against him. By June their armies had coalesced in Belgium. Austrian troops had marched into northern Italy, and the ineluctable Russian masses lugubriously moved north toward the German frontier. By July, if not sooner, France would be invaded. So like an ancient fury he raised a nation to wrath. His best troops secretly gathered between the Meuse and Sambre rivers...within a single march of the Belgian border. Spies reported that, though Wellington and Blucher had pledged mutual support, their armies drew upon separate supply sources at opposite ends of the prospective theater of operations. A victory against either would cause them to draw apart...yielding to him the critical central position, which he would then exploit for the final, decisive battle. Fortune's die was cast at 2:30 a.m. On the 15th. Within hours Prussians were encountered guarding the crossing places of the Sambre. Sharp skirmishes took place at Binche, Charleroi, and Gosselies, while a small battle developed at Gilly. But all of these troops retreated towards Sombreffe. At Frasnes, the Guard light cavalry encounteres troops clothed in green, not Prussian blue, and these men fell back in a different direction; keeping to the Brussels road. Napoleon orders Marshal Ney, just arrived from Paris, to take command of the left wing of the Armee, and to pursue in this same direction, maintaining the drive directly on the Belgian capital. First, however, he must seize the all-important crossroads at Quatre-Bras, knowing somewhere among the tall rye and light woods ahead, waits the Duke of Wellington, in command of nearly 100,000 English and Allied troops. La Bataille des Quatre Bras is the second of four boxed sets detailing the climactic moments of Napoleon's last 100 days as Emperor of France. This completely revised edition of a La Bataille Series classic features game components updated to the latest industry standards. Rejoin the desperate struggle for the crossroads between the left wing of the Armee du Nord and the Army of the Low Countries with new game pieces, player aids, and box graphics. Ideal for one-on-one play or solitaire study, the venerable La Bataille Series captures tactical Napoleonic warfare in dramatic fashion. Each map hex represents approximately 100 metres across; each game turn 20 minutes on the battlefield. Game pieces represent specific units; infantry by regiment and/or battalion; cavalry by regiment; artillery by battery. Units are individually rated for melee and fire combat, morale, movement, and where applicable, range. Important personalities are also portrayed. The fully illustrated rules are the latest edition of the award-winning system developed by the Marshal Enterprises Household and cover the full range of features characteristic of the Napoleonic battlefield. They include detailed orders of battle for each army and a historical narrative supplying the gamer with a thorough perspective of the events of June 16th, 1815. La Bataille des Quatre Bras is fully compatible with La Bataille de Ligny. Together, they provide the complete counter mix for the expansion modules La Bataille de Mont St. Jean (Waterloo) and La Bataille de Wavre. 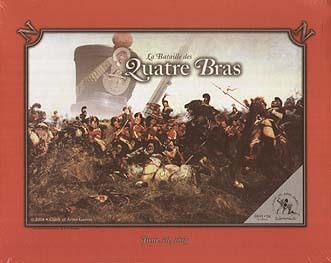 La Bataille des Quatre Bras is one of the most definitive studies done on a Napoleonic battle for the Gaming public. It is, therefore, designed with the serious aficionado in mind. A Marshal's baton in every box.